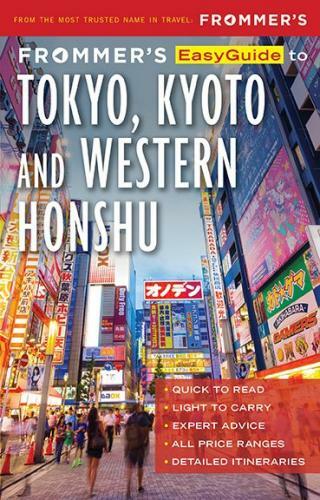 In a country of fascinating contrasts--ultramodern cities, ancient traditions, majestic mountain ranges--Frommer's cuts through the noise and confusion to deliver a guide to Japan that's clear, candid, thorough, and portable. Expert planning tips, honest assessments of hotels and attractions, accessible itineraries designed to appeal to a wide range of interests, and insightful commentaries on Japanese history and culture lead travelers to the sort of authentic experiences and exciting adventures that make for truly unforgettable journeys. It's the sort of travel that Frommer's has been making happen for more than 60 years. And with accurate and timely pricing info as well as helpful money-saving advice, you can see Japan no matter the size of your budget. About Frommer's: There's a reason that Frommer's has been the most trusted name in travel for more than sixty years. Arthur Frommer created the best-selling guide series in 1957 to help American servicemen fulfill their dreams of travel in Europe, and since then, we have published thousands of titles became a household name helping millions upon millions of people realize their own dreams of seeing our planet. Travel is easy with Frommers. Beth Reiber's career as a full-time freelance travel writer has spanned more than three decades and taken her to 35 countries. She's the author of eight guidebooks and her articles have appeared in more than 55 publications and websites. She first visited Japan in the 1980s for what was to be a short trip but ended up staying and working as editor of a travel magazine published in Tokyo. She has been the author of Frommer's guides to Japan for 30 years. Since 2009 she has been a VISIT JAPAN AMBASSADOR, an honorary title awarded by the Japanese government for her contributions in promoting travel in Japan. She resides in Lawrence, KS.